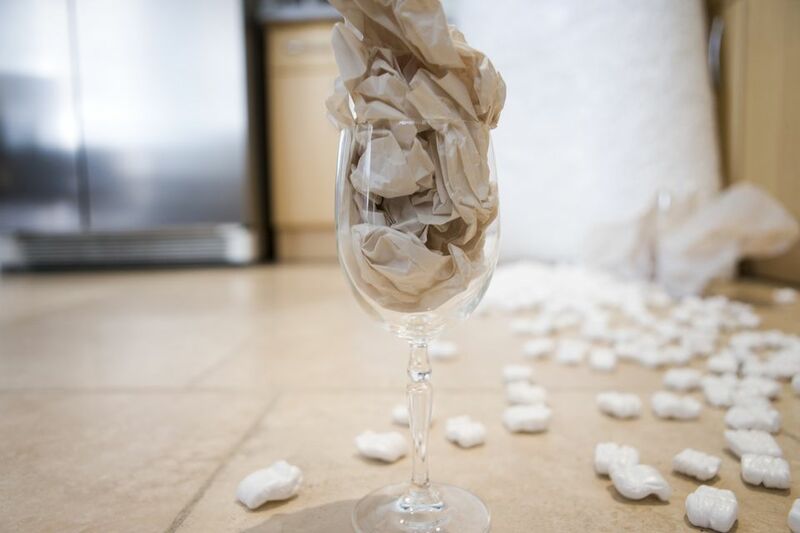 Moving to a new home presents plenty of packing challenges, not the least of which is how to pack your fragile stemware in a way that prevents damage during the move. Use this easy step-by-step guide to pack fragile stemware such as crystal, wine glasses, and goblets. Purchase cell boxes from a specialty packing supply store or ask for used boxes at a grocery store or liquor store. You can also purchase the cardboard dividers (cells) separately. Just make sure they fit the size box you're using. The goal is for each glass to fit comfortably into its own individual cell. Assemble the cell box and gather both plain white or brown packing paper and tissue paper. Select a glass. Take several sheets of tissue paper and gently stuff it into the interior of the globe of the glass. Keeping filling the space until there is no space left. Be gentle. Don't press on the sides of the glass or push the paper in tightly. Lay out several sheets of tissue paper and place the glass on its side perpendicular to the corner of the paper. Take two to three sheets of tissue and pull the corners around the glass, then gently roll the glass forward, gently tucking the tissue into the globe and around the base until the glass is completely wrapped. Place the tissue-wrapped glass on a large piece of plain packing paper. Use the same technique you used to wrap the glass in tissue, only this time keep the ends of the paper untucked. Gently fold the ends of the paper down around the globe and stem, carefully molding it to the glass. Repeat this procedure again to ensure the glass is properly protected. Place the glass into one of the cells, stem first. Gently pack tissue or bubble wrap into any open spaces. Repeat the first eight steps of this guide for the remaining stemware. After you fill each cell and the box is full, place bubble wrap or tissue paper on top of the packed stemware to ensure there's no room for movement. Secure the flaps and then gently shake the box. If the box rattles, there are some gaps that need to be filled. After you fill all the remaining spaces, tape the box closed. Mark the box "Fragile" and label it with the appropriate room at your new home and the contents. You can pack other non-stem glassware in a similar manner. Just make sure each piece is well-wrapped and there are no empty spaces in the box that allow the contents to shift around and possibly break during the move.